We know that reviews are important to couples, and who better to share with you what makes us special than the couples we serve. October 2018 – “Where do I even begin?! Tricia and I had been in contact for over 15 months regarding our big day. 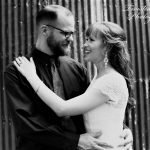 From our very first look at Silo and Oak, my husband and I knew that this was the place we wanted to get married. The venue is simply magical and only gets better with time. When I say that this venue is magical, it is truly and understatement. Every time I wanted to call the wedding off and elope and just give up on all the wedding chaos (and there will be wedding chaos), I would just contact Tricia to come out to the venue. We probably went down in history as the couple with the most venue visits, but it was so so worth it. Each time I left the venue, I was rejuvenated and ready to go again and continued head on with wedding planning. 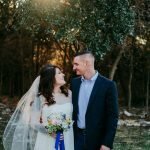 We had our ceremony in the woods at their new ceremony site and it was beyond beautiful. 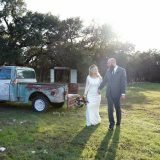 The most beautiful thing happened during our ceremony.. 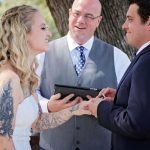 While my husband and I were sharing our vows.. butterflies appeared out of nowhere. It was almost so perfect that our guests thought we had done that on purpose and had some sort of nectar to keep them around. It seriously was more beautiful than could even be put into words. 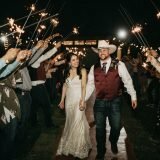 This venue is so unique and truly goes with any theme and color scheme you may be thinking of. Not only that, but what happened during our ceremony is just one of the many natural things that make this venue so magical. It is like no matter what ideas you come up with, it all just works out, it all just.. FITS. The family who owns Silo and Oak brought us into their world and always made us feel at home. Tricia gave the best hugs and always put my nerves at ease. We looked at so many venues, but once we saw this one.. we just knew. Anyone who is looking into Silo and Oak.. I can almost guarantee that you will have that same feeling too! Thank you again Tricia and Steve for making our special day the best day of our lives and one for us and all of our guests to remember. We are truly blessed to have you in our lives for our wedding day and the rest of our lives! 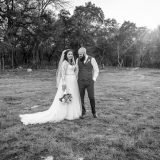 “On February 18, 2017 at 11:00 a.m. my husband and I got married at Silo and Oak. We had a wonderful experience and would like to share it with everyone. 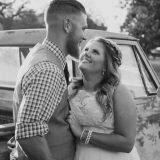 Early January 2017 my husband and I had planned on getting married on February 18 which gave us about 6 weeks to plan. I frantically started my search for a wedding venue that would meet our needs. I had sent out multiple RFQ’s with no luck, seeing how it was such short notice and a very small budget. That’s when I came across Silo and Oak on the website “The Knot.” We were immediately draw to photos of the outdoor space that had been posted on the website. So we sent and email and hoped for the best. We received a phone call within 24 hours from the owner, Tricia Simmons. she was very excited, as were we, seeing how if everything went well we would be the first couple to be wed at the official venue using all of the amenities they have to offer. Tricia was very up front on the phone telling us the date would be available, but that the venue was still in the process of being built. We really liked the outdoor space, so we decided to go have a look anyways. upon arrival at the venue we were greeted by Tricia Simmons. she was very polite and gave an awesome tour of the venue. she made us feel very comfortable, not rushed, and answered all of our questions. At the end of the tour my husband and I had already known that we had found the perfect venue for our small wedding. Over the course of the next few weeks before the wedding, we watched in amazement as the unfinished venue started to shape into the beautiful Silo and Oak. 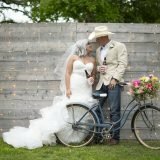 it went from plywood walls to rustic elegance in just weeks. On the day of the wedding I was extremely stressed out, and hoping that everything would turn out as planned, luckily, not only did we have our families by our sides but we had the Simmons family right there as well. not only did they keep the entire wedding on schedule, they also aided in set up and tear down, and so much more. I couldn’t have asked for a better blessing. After returning to work I received so many complements on how beautifully everything went and how much everyone loved the venue. Everything went perfectly.